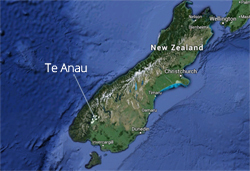 Below you can find links to maps of relevance to visitors and residents in Te Anau and Manapouri. Topographical maps of Fiordland National Park are available from the Fiordland Department of Conservation visitor centre, which is on the lake front just south of the main street. You can also buy them in Outside Sports and Fiordland Frontier on the main street. To view topographical maps of the park online on the extremely useful Topo Map website. For a useful map of campsites in the national park, go to this Department of Conservation page. Places you can walk your dog are restricted. Go to this Department of Conservation page with links to dog walking maps.